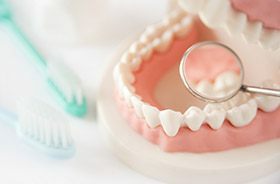 The early stages of gum disease may seem relatively harmless, but it’s important to address this infection as soon as possible because of what could happen if it’s left untreated for too long. In fact, gum disease is the leading cause of tooth loss among American adults. At First Line Dental, Dr. Stanko and the team are here to lend a helping hand when you need it most. We can diagnose tell-tale symptoms of gum disease during dental checkups and provide dedicated therapy to revitalize your smile’s health. Please contact us in Manchester, CT today to schedule a first appointment, or if you have any questions. 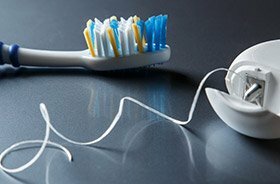 Why Choose First line dental for Gum Disease Treatment? While the teeth may be the star of the show when it comes to your smile, the gums are their essential foundation. This tissue and the jawbone that exists underneath it gives your overall smile the strength and stability it needs to thrive in everyday life. If the gum tissue deteriorates, even healthy teeth can become loose and fall out. At First Line Dental, our team will do everything we possibly can to help you prevent this outcome through personalized therapy. 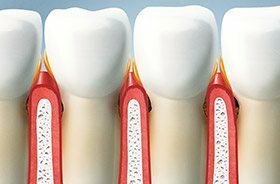 While there are several types of periodontal therapy depending on the severity of the patient’s symptoms, the most common recommendation is scaling and root planing. This procedure is sometimes called a“deep cleaning.” Our team will access the areas of the mouth around and underneath the gum tissue, removing accumulations of plaque and tartar and smoothing the rough surfaces on the tooth roots to discourage further build-up. This also helps the gum tissue reattach to the teeth more successfully. After your therapy is complete, our team will go over a maintenance care plan with you that should help prevent further flare-ups of the infection. Oftentimes, this means scheduling four professional cleanings a year at First Line Dental, as well as being meticulous with your homecare, which should include twice-daily brushing and thorough flossing. These efforts will keep plaque better under control and reduce harmful tartar buildup.